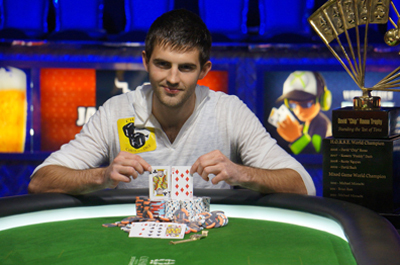 The British Matthew Ashton won the title of the $ 50,000 Poker Players Championship tournament. The young professional of poker, aged of 25 years, participated into three final tables, during the edition 2013 of the World Series of Poker (WSOP) and managed to climb the first step of the podium, in the poker room of Rio All Suite Hotel & Casino. Note that Ashton crossed a field of 132 participants, composed of numerous poker stars, before his victory. His exemplary performance was awarded by a superb gain of $ 1,744,989. Thus, Matthew Ashton is the youngest player who won the Chip Reese trophy. Besides, the achievements that he realized throughout this worldwide championship were enough to rise him at the top of the WSOP ranking, Player of The Year. Concerning the results of the other finalists of the tournament, Don Nguyen occupies the place of runner-up, John Hennigan completes the podium, while the French David Benyamine finished 4th. The game continues at Rio, with the kickoff of the Main Event at $ 10,000. A great attendance is noticed, because during the Day 1A, 1,000 players registered. The day ended with the elimination of the half of the field. The American Evan Panesis leads the running with 190,975 chips in hands. The Day 1B has also started with a field of about 2,000 participants, composed of several notable of poker such as Liv Boeree, Sorel Mizzi and the legendary Doyle Brunson.